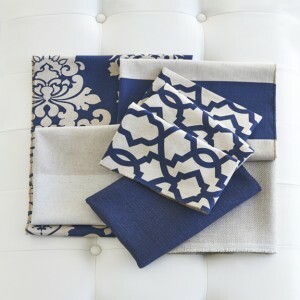 Whether your style is a little Bohemian, Woodstock inspiredor even Nautical, there are home décor fabrics available on the market to ensure you remain true to your designer spirit. Envision Marrakech markets and you define Bohemian Chic. It is a way to express your “inner hippie”. Creating Bohemian Chic decor means creating a laid back, personalized atmosphere. 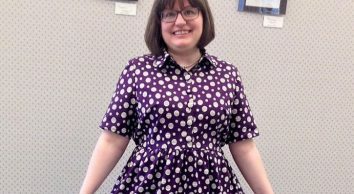 There are no rules here for matching colours and prints. Anything goes! Colour is key in this trend: rich shades of orange, pink, teal, read, blue, yellow and purple. Prints are intricate and textured. Trims are very important to achieve the Bohemian Chic look; tape, beads and embroideries. Lots and lots of colourful pillows! 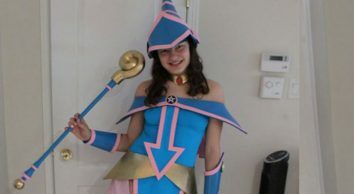 Ideal look for adolescent girl as well. Colour is key in this trend. A retro look reminiscent of the 1960’s. Woodstock elements include corduroy and plush fabrics, wallpaper and murals, leather, sliver metal accents. Bold florals, stripes, houndstooth, plaids and geometric prints. The key colours are orange, green, yellow, brown and beige. More of a minimalist look that works well with clean lines of modern furniture. 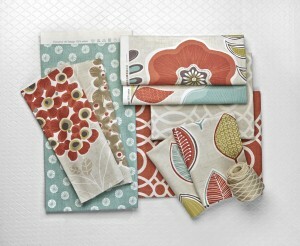 Woodstock Fabric Collection – A retro look reminiscent of the 1960’s. 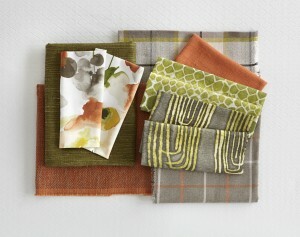 Woodstock Fabric Collection – Key colours are green and orange. The Nautical style is a perennial look; one of our oldest and most consistent trends! Based on the most popular and calming colour blue, accented with white, red and yellow. 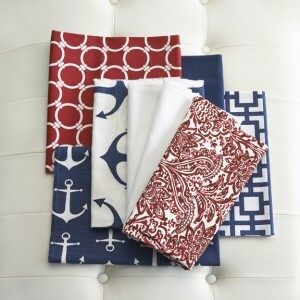 Prints are fine and bold stripes, anchors, sail boats, boat knots. 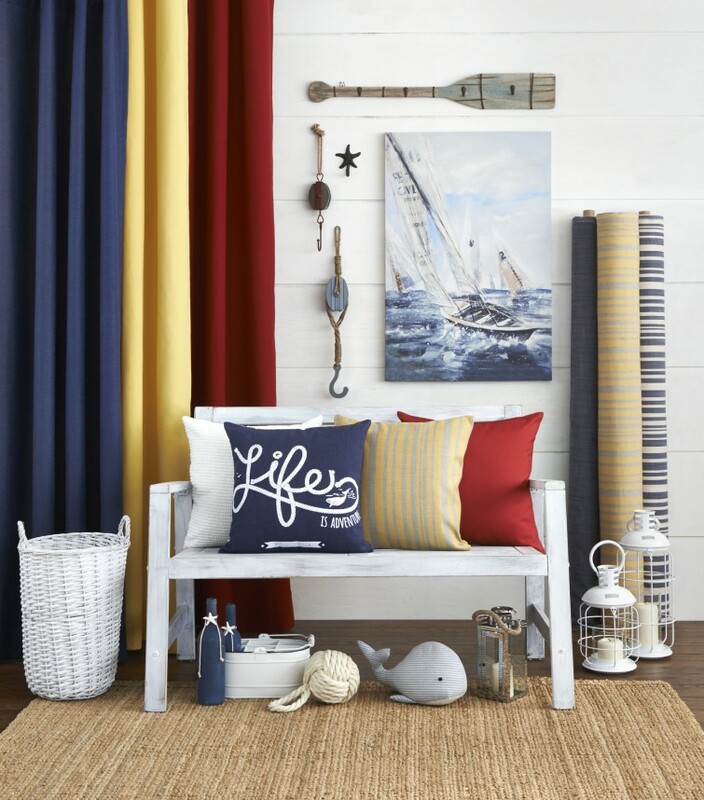 A fresh and crisp look that brings marine life indoors and can be a perfect look for a cottage or young boy’s room. It is a look that can be elegant as much as it can be casual. A fresh and crisp look that brings marine life indoors. We hope you have enjoyed reading about what has inspired Fabricville’s fabric collections! Stay tuned for more trends! Que j’aime vos collections Décor Maison!